Ghairat continues to be interesting, engaging, impactful and convincing. So far, I feel the one thing which sets this drama apart from many other dramas which aired recently and dealt with similar topics is that it focuses on the reasons why even a girl like Saba, who is brave and intelligent would find it impossible to find an escape out of such a situation. Right from the first episode Saba has been shown as someone who tries her best to find solutions for problems affecting her or her family members. Although she was terrified of her brother even in the beginning of the show even then that did not stop her from speaking her mind. What I truly appreciate about her character is that usually the outspoken and confident women in our dramas are also the ones who land themselves into trouble due to their actions but Saba has been shown as someone who is intelligent and practical. Even in the most desperate of situations she tries to find a solution which is workable. In tonight’s episode she tried to convince her mother over and over again that she should try to find a way out because she knows that there isn’t much she can do in this situation. Iqra Aziz has been quite impressive so far, apart from her outfits and styling, everything else about the way she has translated her character on screen is remarkable. Saba’s mother’s character is also realistic which is why even with all her weaknesses, I can’t help but relate to her. She is just as helpless as her daughter even though she wants to do something to help Saba. Her character also gives us hope that she might some day muster up the courage to take an extreme action to help her daughter and the preview of the next episode suggested just that. 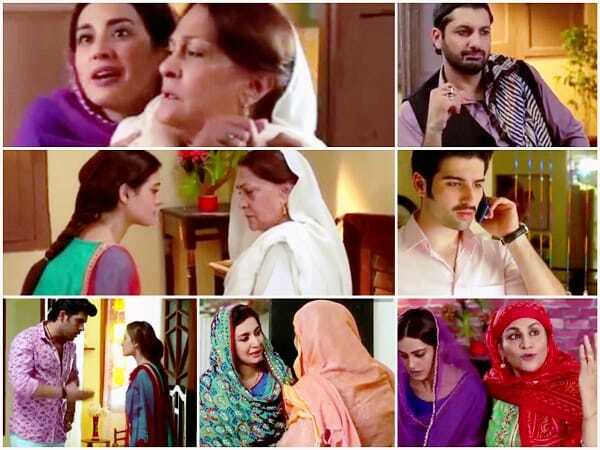 Samina Ahmed just like always has also done complete justice to her character. Zohaib’s character has also been etched-out flawlessly. He has to move to Islamabad but naturally he does not want to be away from Saba. You understand why he has not been able to help Saba in any way even though he has not been shown as a weak character but his limitations are easy to understand and you know that if he has an opportunity to help Saba, he won’t back off. Usman’s character is a true reflection of all such monsters who think they are god. He was especially terrifying in the last scene of tonight’s episode. This man has absolute no remorse and his own ego comes before everything else. Jibran Syed owns his character completely which is why Usman’s character is not only ugly but also horrifying. This drama truly makes me think about all those women who live under such circumstances and it is upsetting to think that no one comes forward to help them because it is considered the family’s “private matter”. Relatives like Zohaib’s mother even with all their good intentions have to take a backseat because they fear for their lives. Saba and her mother’s bond has to be the best aspect of this drama, this bond has only grown stronger after Iqra’s death. Overall, this was another brilliant episode of Ghairat which laid the foundations for what is coming ahead. The preview of the next episode was very enticing, definitely looking forward to watching the next episode. However I do wish that the previews would be shorter because they tend to give away the major developments in the story. How many of you watched this episode of Ghairat? Do share your thoughts about it.